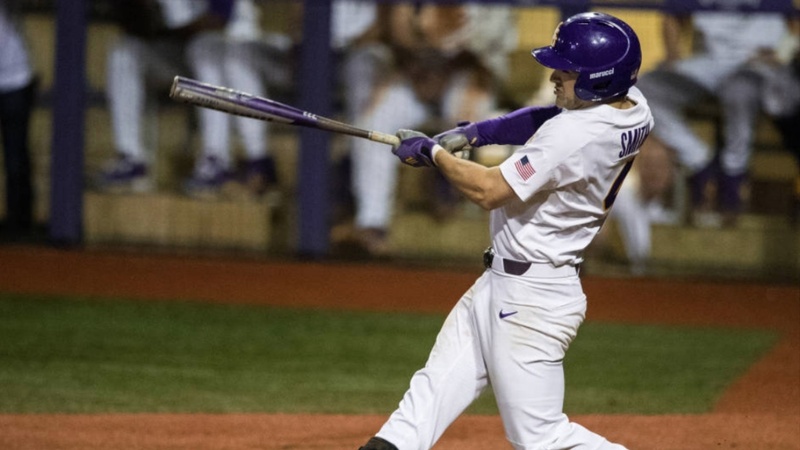 BATON ROUGE – With one out in the bottom of the eighth inning, junior shortstop Josh Smith belted a solo home run to break the tie game and propel the No. 9 LSU baseball team to a series opening 2-1 victory against No. 9 Texas A&M Friday night in Alex Box Stadium, Skip Bertman Field. With the win, LSU improves to 22-9 on the year and 7-3 in the SEC while Texas A&M drops to 24-7-1 overall and 6-3-1 in the league. The Tigers and Aggies will return to action in a doubleheader Saturday at The Box. The first game of the doubleheader is slated for 2 p.m. CT and will be online only through the SEC Network+, and fans are asked to use their Game 23 tickets. The second game will be on ESPN2 and has a first pitch time of 7 p.m. CT. Fans should use their Game 22 tickets for the 7 p.m. contest. Both games will be broadcast on the LSU Sports Radio Network. Fans can listen live online at LSUsports.net/live. LSU and Texas A&M have met 19 times since the Aggies joined the SEC, and nine of the 19 games have been decided by one run. Junior right-hander Zack Hess was brilliant Friday in six innings of work for the Tigers. He limited Texas A&M to one run on five hits, walked three and struck out five. Trent Vietmeier was the next man up for LSU, and he blanked the Aggies in 1.1 innings with a strikeout. Devin Fontenot improved to 4-0 on the season after shutting out Texas A&M in the final 1.2 innings. He gave up one hit and struck out three. Texas A&M starter John Doxakis allowed one run—zero earned—on four hits and struck out four in 6.2 innings. Sophomore right-hander Bryce Miller suffered his first loss of the season and fell to 4-1. He allowed one run on one hit and struck out one in 1.1 innings. “Hess and Doxakis both pitched their hearts out and excelled in clutch situations,” Mainieri said. “Our bullpen was tremendous, too – Vietmeier and Fontenot were outstanding. Texas A&M grabbed the 1-0 lead in the top of the third inning when designated hitter Logan Foster scored from second on center fielder Zach DeLoach’s one-out single up the middle after a leadoff double. In the bottom of the seventh inning, second baseman Brandt Broussard was first-pitch swinging and sent a ball to right field, which was misplayed by Jonathan Ducoff and allowed Broussard to reach third. After rounding third, Broussard was able to score on a throwing error by Ducoff, which tied the game 1-1. In the bottom of the eighth inning, Smith blasted his second home run of the week and fourth of the season to give the Tigers the 2-1 lead.